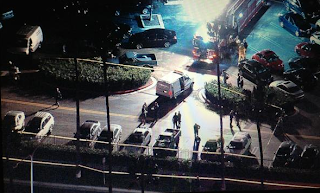 As many know by now, a lone gunman fired a reported 50 shots from a handgun late in the afternoon Saturday in the Macy's parking lot at Fashion Island. He was apprehended, apparently without incident, by the Newport Beach Police. Several stores in the mall were reported to have been locked-down. Perhaps the best coverage of this event by local media was provided by Amy Senk on her Corona del Mar Today site. That really doesn't surprise me, since she covers Corona del Mar like a blanket. She had an early report, HERE, almost immediately after the event occurred. She followed up with a very comprehensive entry, HERE, later in the evening and wrapped it up with yet another entry, HERE, much later in the evening which quoted the Newport Beach police press release. Rumors continue to swirl around this event. One report, unconfirmed, was that a person was found shot and stabbed at Macy's. One would assume this is a false report since no official word has been released to that effect. No word on why the alleged gunman, identified in several reports as Marcos Sarinana Gurrola, 42, of Garden Grove, decided to shoot up the place yesterday. We need to find out why this is happening so much in the USA. I like and own guns. Let's look at all factors.